Is the adjective "ultra-linear" exclusively associated with high-fidelity amplifiers? Hardly. Many would be surprised to learn that the 200-watt Marshall Model 1967 head was an ultralinear power amp. So was the Sunn Model T Super. Even Fender built an ultralinear amp. Despite their lack of popularity today, for guitar amp designers ultralinear amplifiers reveal important details about the inner workings of triodes, pentodes, and beam power tubes in the context of a push-pull amplifier. Understanding the nuances of ultralinear design provides valuable insight into how a power amp works. Consider the classic push-pull guitar amplifier power amp, where the screens are connected directly to the plate supply. Normally there is an intervening choke or resistor combined with a large capacitor to provide ripple filtering and DC voltage regulation, but we will assume the DC plate supply Vpp is already well filtered. 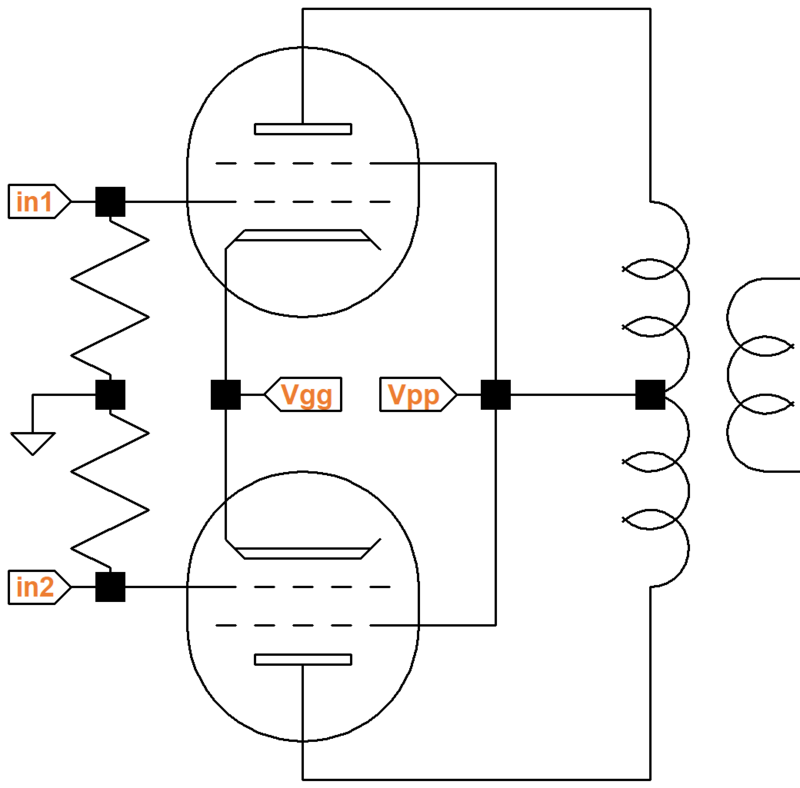 This is the normal configuration for a guitar amplifier power amp, where the screens are held to a relatively constant voltage and the plates are connected to the high-voltage supply via the output transformer load. The plate voltage varies over a wide range, but has little influence over the plate current. The constant screen and the signal-varying grid determine the current through the load. This is classic pentode operation. When we connect the screen of a pentode or beam power tetrode directly to the plate, the two electrodes electrically act as one. They combine to create a mechanically interesting, if electrically simple, composite electrode. The screen and the plate together become just a single plate. The multi-grid tubes act as simple triodes. The tube is now "triode connected." Together the screen and plate act together as a weirdly manufactured, but nevertheless effective plate. As the plate voltages of the power tubes vary, they greatly affect electron flow, just as in a triode. 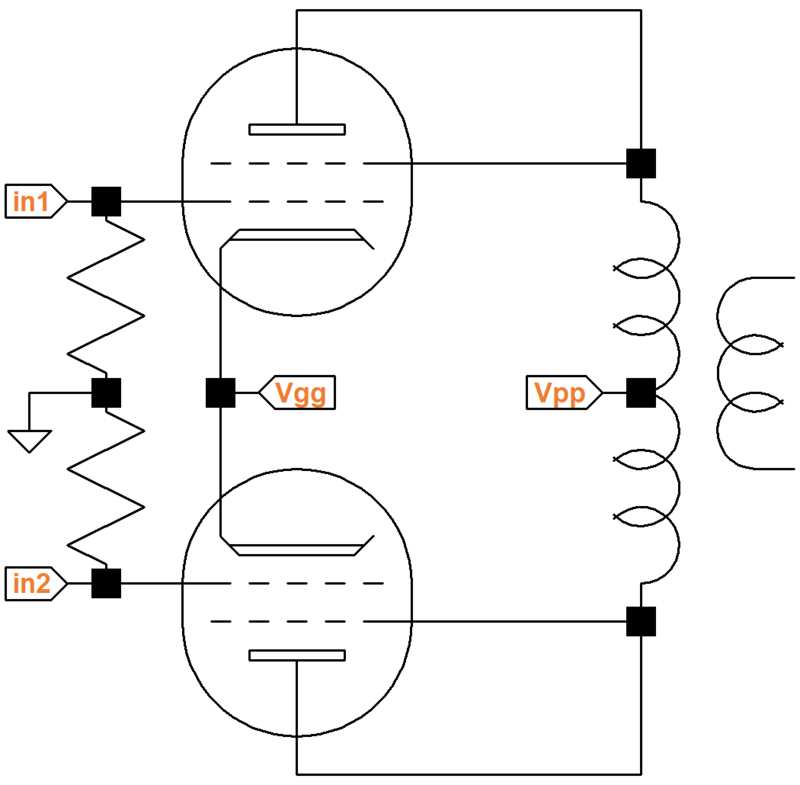 In particular, as the signal voltage at the grid increases, current through the output transformer increases, which causes a greater voltage drop across it. This lowers the plate-and-screen voltage and counteracts the increase in current created by the grid's signal voltage. We don't see this effect in a normally-configured guitar amp power stage. 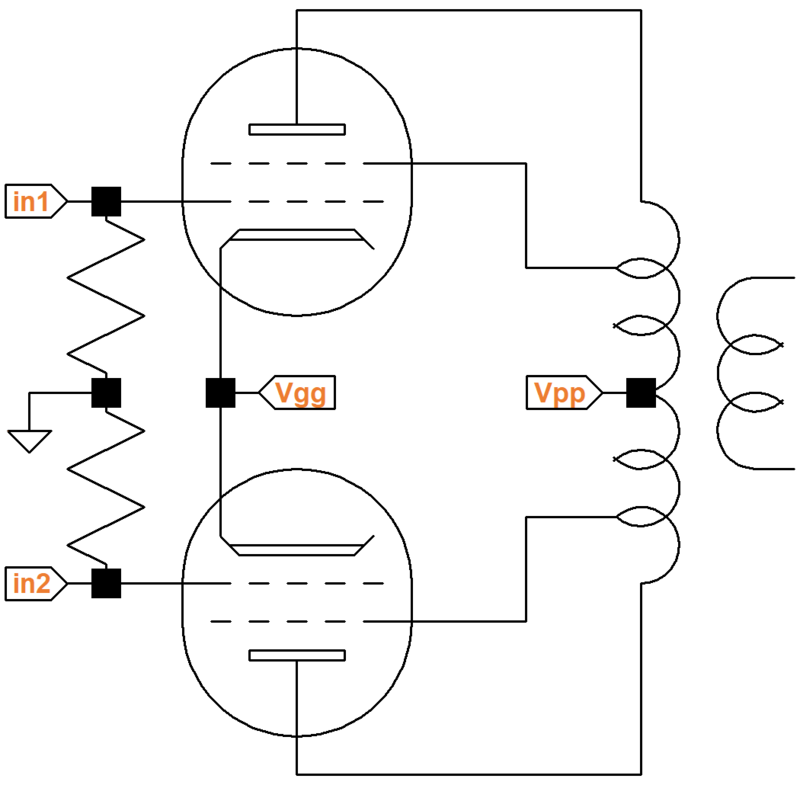 When the screens are connected to taps in the power transformer primary, the tubes operate at a point somewhere between pure-pentode and pure-triode operation. The closer the tap is to the plate, the more the screen voltage varies with plate voltage and the more the pentode acts like a triode. Connecting the screens in this way can be seen as having pentodes with negative feedback. When the plate current increases, the screen voltage decreases, counteracting the increase in plate current, not as much as a triode plate, but substantially nonetheless. Connecting the screens in this way can be seen as having pentodes with negative feedback. When the plate current increases, the screen voltage decreases, counteracting the increased plate current. The screen taps in output transformers designed for ultralinear operation are typically set to 43 percent of the primary winding, which is the point of minimum distortion. Since impedance varies as the square of the number of turns, the primary impedance for a power tube screen is 18.5 percent of the primary impedance for the plate. Maximum power is achieved with the taps at 20 percent of the primary winding, which corresponds to 4 percent of the primary impedance. In other words, much more pentode and less audiophile triode. This is perhaps a better choice for a distortion-salivating stadium amp. "We have achieved a new tube type without designing a new tube. This tube is neither triode nor tetrode, but its improved linearity over either of these types justifies the designation ultra-linear." 1David Hafler and Herbert I. Keroes, "An Ultra-Linear Amplifier," Audio Engineering, Nov 1951, pp. 15-17.